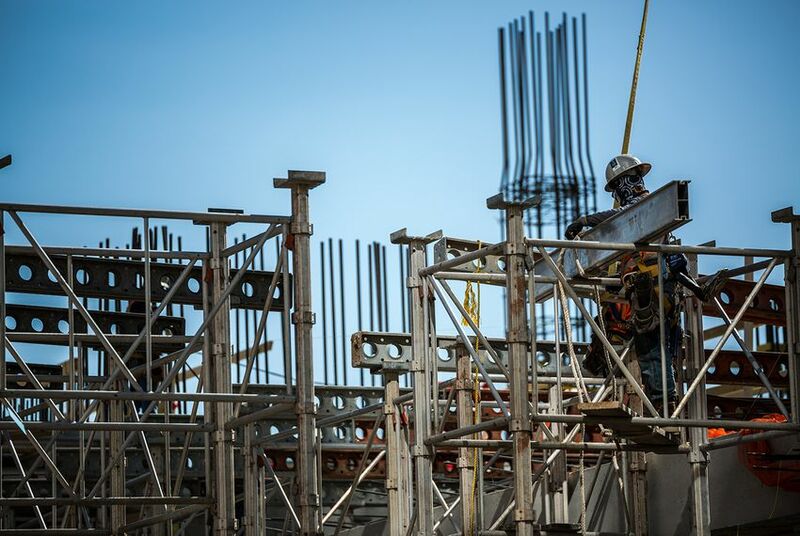 With the beginning of the special legislative session, opponents of construction permitting rules in Austin that require more worker protections in exchange for a faster process have the chance to overturn local regulations like Austin's. Cesar Ovalde has been working in the construction industry for the better part of 15 years. Most of the time, he’s working on large commercial projects, and gaps in training, he says, can cause problems. “A lot of times there are new people that arrive and they don’t know the standards. If there’s an electrician that is working as a painter or vice-versa, they don’t know each other’s work and this can frequently cause accidents,” he said in Spanish. In Austin, though, workers like Ovalde received some relief when the city council passed new regulations: Companies that went through a newly-created expedited permitting process for large commercial projects have to follow a set of “better builder” protections that require companies to pay workers at least $13.50 an hour, follow certain safety standards and offer training and worker’s compensation insurance. The requirements were a compromise — the result of years of negotiation between city officials and developers to speed up the permitting process in Austin. But with Tuesday's beginning of a special legislative session, that compromise — launched in March — may be short-lived because of House Bill 164, which seeks to accelerate permitting processes in cities and towns across the state, and also bar cities from requiring companies to follow regulations like Austin's “better builder” rules. The legislation has given industry groups another chance to kill the Austin regulations that they say are cumbersome and unnecessary. Some contractors are particularly irked that any job site that qualifies for the program must be monitored by the Workers Defense Project, a labor advocacy group that helped create the Austin regulations. And they’ll rely on a longtime ally: state Rep. Paul Workman, R-Austin, one of the authors of the legislation. Before he was elected to the House in 2010, Workman spent years in the contracting and construction industry. He launched Workman Commercial Construction in 1991, and the company completed dozens of projects across the state before he sold it in 2013. He donated more than $8,000 to the state and local branches of the Associated General Contractors and served as the the chairman of the board of the statewide organization in 2008. He’s no longer a member of the organization, but it has supported him in the Legislature: Since 2013, Workman has received at least $63,000 from the statewide Associated General Contractors political action committee and affiliated local chapters, according to campaign finance disclosures. Data compiled by Texans for Public Justice, a liberal watchdog group, show that Workman has received a total of $342,932 from real estate and construction interests since 2013 — 36 percent of his total campaign contributions. Workman is one of many lawmakers who have received financial support from real estate and construction interests, according to the data from Texans for Public Justice. Gifts to lawmakers from those two industries totaled more than $23 million between 2013 and 2016, the group found. Workman, who also runs a construction consulting business with his son, said that he became interested in expedited permitting legislation on his own and did not not speak with donors or interest groups about his bill. None of his consulting clients do business in Austin, he said. “It’s bad for the industry, what [Austin has] done, and so whether I had been supported by the various construction industry people or not, I would have done this,” Workman said. Workman Commercial Construction declined to comment on the expedited permitting process in Austin. Olvade said he would like to see "better builder" requirements expanded in Austin, not discarded. Sam Robles, the communications director for the Workers Defense Project, said that the group would oppose any legislation aimed at overturning the “better builder” requirements. “We look forward to having a conversation with Texas policymakers about our disagreement with legislation that cuts the pay for hardworking men and women who build our cities, roads and bridges,” she said. At a Texas Public Policy Foundation conference Monday, Workman said he's protecting Austinites by attempting to override the city regulations. Disclosure: Paul Workman and the Texas Public Policy Foundation have been financial supporters of The Texas Tribune. A complete list of Tribune donors and sponsors is available here.